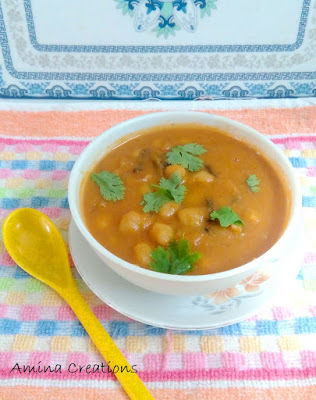 Chole masala or Punjabi chana masala is a very popular chickpea dish that tastes great with roti, chapathi or naan. It is a delicious and flavourful dish made by cooking chickpeas in a gravy of onions, tomatoes and spices. It is the addition of ground chickpea paste that adds a great taste, texture and the desired thickness to the gravy. Take half of the boiled chickpeas in a mixer grinder and grind to a smooth paste. Keep ready.